By allowing cannabis lounges, San Diego area officials could remove consumers from public spaces and boost the local economy. The black market for alcohol is nearly non-existent in California because consumers have relatively easy legal access to those products. At long last, cannabis is officially legal in California. The consumption of cannabis, however, is still prohibited in many places. Not only does that undermine consumer rights but it enables volatile black market pockets across the state. Just earlier this month, the city of West Hollywood announced it was taking steps to reverse this by permitting cannabis consumption lounges. These lounges will include Amsterdam-style coffee shops and establishments where consumers can consume cannabis via smoking, vaping or through consuming edibles. The city will issue 16 lounge permits, eight of which will allow for smoking, and eight that will only allow for vaping and the consumption of edibles. For many, the thought of smoking cannabis indoors seems strange and foreign, but it is a huge win for consumers and West Hollywood’s economy. Access to cannabis lounges matters for consumers in the same way that access to bars and pubs does for alcohol consumption. The reason why we don’t have rampant public consumption of alcohol on city streets is that people can consume alcohol in controlled and licensed settings. Cannabis consumption should be no different. San Diego would be wise to take note. By allowing cannabis lounges, officials actually remove consumers from public spaces, where they may bother or irritate others, and therefore won’t impact the public at large. Increased consumer access also significantly increases the likelihood that consumers purchase cannabis in the legal market, and not the black market. The purchase of black market alcohol is a rarity in California, mostly because consumers have relatively easy legal access to those products through liquor stores, bars, pubs and clubs. If regulators want to stamp out the black market, which they rightly should, ensuring legal consumer access should be a priority. In addition to the benefits that cannabis lounges bring to local consumers, these lounges are also incredibly important for tourists. For tourists, or visitors more generally, space for cannabis consumption is quite limited. Hotel owners, or owners of any private space, are well within their rights to prohibit cannabis consumption on their private property. Because of this, tourists in cities that do not have lounges ultimately end up consuming in public spaces. Lounges solve that problem, while generating positive economic outcomes for the local economy. We have seen this trend firsthand in Colorado. Colorado tourism conducted a survey in 2016 and found that 15 percent of the 82 million tourists who visited the state engaged in cannabis activity. Considering that over 260 million people visit California each year, the financial prospects are astounding. 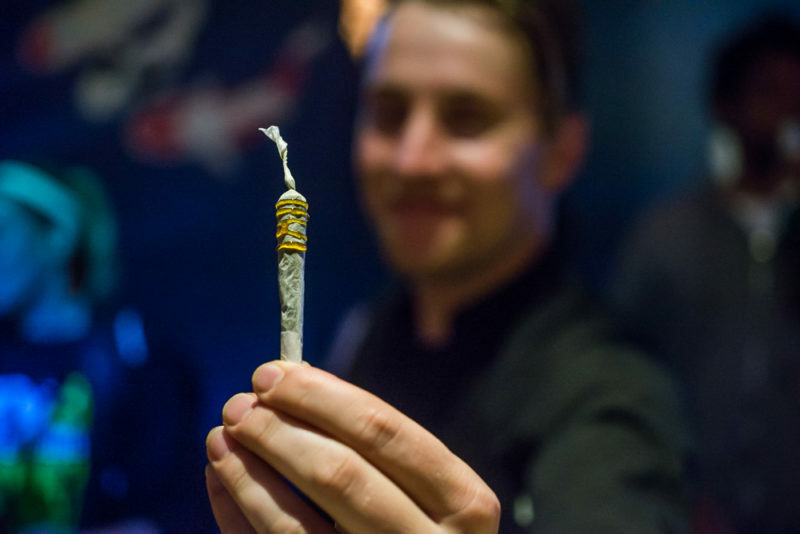 Simply embracing the cannabis economy through increased store access and lounge availability could give many local economies the financial boost they so desperately need. With increased consumer access and permissible cannabis lounges will come great economic benefits, a positive outcome that makes San Diego County’s prohibition puzzling at best. Instead, the Board of Supervisors should follow West Hollywood’s lead. The major issue within San Diego County is that many cities and towns are still holding on to their prohibition mentality. For example, Encinitas, a city where 65 percent of voters favored Proposition 64, has a complete ban on all cannabis businesses. In La Mesa, where 59 percent of voters favored the measure, the City Council has enacted a recreational cannabis ban while only allowing for medical cannabis activity. Local regulators are turning their communities into pockets of prohibition, where consumers are purchasing cannabis illegally, and consuming it outdoors in public spaces. Not only are these regulations and prohibitions unnecessary, undemocratic and counter-productive, they are stifling the local economy. Suppressing legal access to a legal product means that these communities are leaving millions of dollars worth of economic activity on the table. California ended prohibition for very good reasons, and it is silly to replicate the mistakes of the past at the local level. If these cities can’t, or won’t, embrace legalization, then the state should mandate change by ending dry counties California-wide. David Clement is the North American affairs manager for the Consumer Choice Center, a Libertarian-leaning advocacy group based in Washington, D.C. See anything in there we should fact check? Tell us what to check out here. David Clement is the North American affairs manager for the Consumer Choice Center, which is based in Washington, D.C.